TEEBAgriFood presents a path-breaking, globally applicable food systems evaluation framework, which for the first time presents all wider benefits and costs associated with all relevant dimensions (environmental, health, social, cultural) of the eco-agri-food value chain in one single report. By evaluating the significant external costs and benefits inherent in different food systems, and making these costs transparent, decision-makers on farms, and in governments, institutions and businesses can make better-informed decisions that take into account the impacts of the available choices. This holistic approach of ‘true cost accounting’ allows the recognition, valuing and managing of the positive and negative externalities of all human behaviour and will lead to more agroecological and equitable food systems. For its comprehensive approach providing opportunities to contribute to the majority of the SDGs and offering an effective system of ‘true cost accounting’, and its respect for the Future Just Lawmaking Principles and Elements of Agroecology, TEEBAgriFood was recognized with the Future Policy Vision Award 2018, awarded by the World Future Council in partnership with FAO and IFOAM – Organics International. In order to improve and secure our eco-agri-food systems and, in particular, to mitigate their negative impacts, all stakeholders including governments, businesses, farmers and citizens, need to be made more aware of the wider benefits and costs associated with different eco-agri-food systems. By offering a framework to enable users to comprehensively and transparently assess the costs and benefits inherent in different food systems, TEEBAgriFood is addressing this issue. TEEBAgriFood is also about a systems approach, methodologies and tools, theory of change, and engagement strategies. Work has been ongoing since 2014. After presenting the TEEBAgriFood Interim Report in December 2015 at Climate COP 21 and Exploratory Studies in 2016 and 2017, the TEEBAgriFood Scientific and Economic Foundations Report was released on 4 June 2018, on the occassion of World Environment Day. The TEEBAgriFood Evaluation Framework will soon be applied in various contexts at the country level in Brazil, China, Colombia, Ethiopia, Ghana, India, Indonesia, Kenya, Malaysia, Mexico, Senegal, Tanzania and Thailand. 2030 Agenda for Sustainable Development and the Sustainable Development Goals (SDG), 2015, as sustainable food systems are both a means and an end towards achieving the SDGs. TEEB suggests using a “three tiered” structure for the 17 SDGs, emphasizing that our planet’s natural resources underpin delivery of the entire 2030 Agenda for Sustainable Development. By visualizing the interlinkages, synergies and potential trade-offs within and between the SDGs, TEEB demonstrates that the SDGs are indivisible and should be implemented in an integrated manner. The successful implementation of target 15.9 – integrating the value of ecosystem and biodiversity values into decision making – is an enabling factor that connects the dots between different goals and targets. The TEEBAgriFood Initiative offers an avant-garde, worldwide applicable assessment framework for the evaluation of agri-food systems, policy and business scenarios, diets and national accounting. In a pioneering way, it presents the full range of categories of impacts (benefits and costs) associated with all relevant dimensions of the eco-agri-food value chain. By establishing all of “what should be evaluated”, it pushes policymakers, researchers, and businesses to capture these in decision-making. Whilst there are several initiatives working towards developing frameworks for a “true cost accounting” (TCA) of food, the TEEBAgriFood Initiative is unique in that it is the only proposal that aims to assess a comprehensive set of externalities (environmental, health, social, cultural) – both positive and negative – across value chains, and at the global systems level. For its holistic approach, TEEBAgriFood won the Future Policy Vision Award 2018. The Initiative assesses multiple types and scales of food production systems, including multiple types of industrial-scale agriculture and livestock production, and also artisanal scale agroecology, pastoralism and fisheries management. In order to be applicable in multiple scales and contexts around the world, TEEBAgriFood takes into consideration all forms of capital that underpin economic and human wellbeing – produced, natural, human and social capital – and is based on the three guiding principles of universality, comprehensiveness and inclusiveness. Natural capital is embedded in the capitals approach advocated by the TEEBAgriFood evaluation framework for eco-agri-food systems. Pathways to sustainability, going forward, must recognize and strengthen those forms of agricultural production that explicitly enhance biodiversity and ecosystem services and build the natural capital that underpins food systems, creating regenerative forms of agriculture and food systems that generate positive externalities. TEEBAgriFood framework can provide a tool to collect and organize information and data on social equity, justice and ethics related to food systems in order to assess progress towards the SDGs. In particular, it offers a tool to assess and compare the costs and benefits of social equity of different food systems. In order to build enabling food systems, TEEBAgriFood looks at dietary pattern change, social justice, food waste and appropriate technological development. Several Sustainable Development Goals are directly linked to human health and food/nutrition security, with all of them indirectly linked, and the TEEBAgriFood Framework can be used as a toolkit for making these linkages transparent. TEEBAgriFood connects the natural capital community with the emerging True Cost Accounting community. It has an interdisciplinary and participatory approach. Being under the lead of UN Environment means to have a great resource in terms of outreach and funding. Supports decision-makers in understanding what should be evaluated and brings transparency. The assessment framework aims at the most comprehensiveness possible. Provides a common language, rooted in economics, for all decision-making contexts. Addresses the lack of awareness regarding the fact that the economic environment in which farmers operate is distorted by significant externalities. Evaluates the impact of the eco-agri-food system at global level, recognizing that smallholder agriculture represents the bigger, most impactful, part of the system. As silo approaches are limiting our ability to achieve a comprehensive understanding of the interconnected nature of the eco-agri-food system challenges, we need TEEBAgriFood and its holistic framework that allows the integration of well-understood individual pieces into a new, complete picture. The framework tries to solve the problem of using one-dimensional metrics such as “per hectare productivity”, which ignores the negative consequences and the trade-offs across multiple domains of human and planetary wellbeing and fails to account for the various dimensions of sustainability. It is ethically appropriate, because it doesn’t attempt to reduce complexity to a single indicator and tries to capture the value of nature through a holistic approach. Agriculture is by far the largest employer in the world, employing around 1.5 billion people. The impact of today’s agriculture and food systems on natural resources is enormous: globally, agriculture is responsible for using 70 per cent of all freshwater withdrawn from the natural cycle, for causing 60 per cent of all biodiversity loss, and for creating large-scale land degradation. As well, more than one-fourth of greenhouse gas emissions come from agriculture and when the effects of land-use change, deforestation, food waste, and all the stages food goes through on its way to people’s plates are included, that proportion climbs to between 43 and 57 percent. Specifically, today we are producing 90 per cent of all calories from a handful of plant species, which in combination with the extensive use of chemical pesticides and fertilizers in agricultural farming methods degrades biodiversity so extensively. Without transforming the way we produce energy, and the way we produce and consume food, international agendas such as the Paris Agreement or the 2030 Agenda will not be achieved. We need to substantially change the way we are producing, processing, distributing and consuming food, in order to achieve the Sustainable Development Goals (SDGs). However, most of the time many positive and negative externalities are not accounted for, making this fundamental transformation impossible. For instance, agricultural productivity is typically measured by yield per hectare, a simplistic metric that provides an incomplete picture of the true costs and benefits associated with agriculture and food value chains. This calls for a holistic, effective system of ‘true cost accounting’ as offered by the TEEBAgriFood Framework. According to Sukhdev, May, and Muller in “Fixing Food Metrics”, sustainable food systems have three key attributes: 1) They should deliver adequate nutrition and health across all levels of income and societal development, 2) they should avoid significant negative ecological and environmental impacts; and 3) they should ensure equitable access to land, water, inputs (such as seeds and fertilizer) and technical and financial assistance for the roughly 1 billion people, who still depend on small farms for their livelihoods. However, the economic environment in which farmers, businesses, consumers, and agricultural policymakers operate today is distorted by significant externalities, both negative and positive. Indeed, most of the largest impacts on the health of humans, ecosystems, agricultural lands, waters, and seas arising from different agricultural and food systems are economically invisible and are not adequately considered by decision- and policy-makers. Most significantly, conventional assessment systems do not effectively capture the changing capacity of ecosystems and supporting social systems to continue to deliver these critical goods and services over the long run. This reality has a significant impact on how food and agriculture policy and practice affects pressing issues like climate change, biodiversity, soil erosion, nutrition, food security, and public health. In order to improve and secure our eco-agri-food systems and, in particular, to mitigate their negative impacts, all stakeholders including governments, businesses, farmers and citizens, need to be made more aware of the wider benefits and costs associated with different eco-agri-food systems. By evaluating the significant external costs and benefits inherent in different food systems, and making these costs transparent, decision-makers on-farm, in governments, institutions, and businesses can make better-informed decisions that take into account the impacts of the available choices. This will lead to more agroecological and equitable food systems. The TEEBAgriFood Evaluation Framework offers this opportunity. Inspired by the Stern Review on the Economics of Climate Change (Stern 2007), which revealed the economic inconsistency of inaction with regard to climate change, it offers a holistic approach of ‘true cost accounting’ that allows the recognition, valuing and managing of the positive and negative externalities of all human behaviour. As a global initiative focused on making nature’s values visible, TEEB’s objective is to mainstream the values of biodiversity and ecosystem services into decision-making at all levels. It aims to achieve this goal by following a structured approach to valuation that helps decision-makers recognize the wide range of benefits provided by ecosystems and biodiversity, demonstrate their values in economic terms and, where appropriate, capture those values in decision-making. TEEB first achieved global recognition in 2008 when officials from 13 of the world’s largest economies (the G8+5), with support from the European Commission and the German Environmental Ministry, commissioned the first-ever global analysis of the economic benefits of biological diversity and the costs of its loss (Phase I). This analysis was followed by a series of targeted reports released in 2010 at the Convention on Biological Diversity (CBD) meetings in Nagoya, Japan, aimed at key audiences – including international policy-makers, local policy-makers and the private sector – with tools for applying true cost accounting to decision-making (Phase II). The current phase of TEEB is the implementation phase (Phase III), in which the TEEB approach is being applied in multiple sectors, biomes and at different levels of policymaking. The two most ambitious applications of TEEB are the Natural Capital Coalition (NCC) -formerly TEEB for Business- and TEEBAgriFood. TEEBAgriFood goes beyond the original TEEB in that it seeks to be inclusive of externalities that are not typically included in environmental economics. This includes the social externalities, cultural externalities and health-related externalities of food systems, both negative and positive (the stocks of eco-agri-food systems comprise four different “capitals” – produced capital, natural capital, human capital and social capital – which underpin a variety of flows encompassing production and consumption activity, ecosystem services, purchased inputs and residual flows) . In February 2014, the TEEBAgriFood Concept Note laying out the ideas behind TEEBAgriFood, whilst in May 2015 the report Toward TEEBAgriFood provided preliminary findings from TEEBAgriFood exploratory studies. The Interim Report presenting the TEEBAgriFood Evaluation Framework was launched in December 2015 at UNFCCC COP21, with the Exploratory Studies that inform it being released individually between Fall 2016 and Spring 2017. The Global Alliance for the Future of Food, a key supporter, has presented the underpinnings of the framework at key international events, including the IUCN World Conservation Congress, the UNFCCC’s COP22 Global Landscapes Forum, the EAT Forum, the WHO Forum on meeting the SDGs, COP13 of the Convention on Biological Diversity, the Barilla Forum, the AFSA (African Food Sovereignty Alliance) conference, and the Global Commons conference organized by GEF and the World Economic Forum. On 4th June 2018 the TEEBAgriFood Scientific and Economic Foundations Report was released on the occasion of World Environment Day in New Delhi, India, hosted by UN Environment and the Government of India. Internationally, a series of launch events are planned throughout 2018-19 to showcase and promote the key messages, findings and recommendations of the TEEBAgriFood reports. The team is seeking strategic promotional and partnership opportunities to disseminate the reports and, more importantly, to build the TEEB AgriFood network into a community of practice and change. Furthermore, depending on the availability of funding, two further reports could be presented in 2018-19: firstly, the Opportunities Report drawing conclusions as to the opportunities for policy and production changes that could be made based on the application of the TEEBAgriFood Framework and, secondly, the Synthesis Report providing clearly articulated key messages with a broad readership in mind, supported by an extensive communications strategy. TEEBAgriFood is a systems approach for bringing together the various disciplines and perspectives related to agriculture and food, a framework for evaluation that supports the comprehensive, universal and inclusive assessment of eco-agri-food systems, a set of methodologies and tools for the measurement of positive and negative externalities, and a theory of change to help integrate TEEBAgriFood into the wide landscape of platforms and initiatives, like the SDGs, that are tackling these complex issues. It therefore plays a crucial role in the transformation of food and agriculture systems. Recognizing that the externalities of human behaviour on ecosystems, landscapes, species and other aspects of biodiversity is a feature of all human societies and communities, and is sometimes sufficient to ensure conservation and sustainable use. For example, the existence of sacred groves in some cultures has helped to protect natural areas and the biodiversity they contain. Valuing these externalities in economic terms is often useful for policy-makers and business stakeholders in reaching decisions that consider the full costs and benefits of an ecosystem, rather than just those costs or values that enter the markets in the form of private goods. Managing the externalities involves the introduction of mechanisms that incorporate the values of ecosystems into decision-making through incentives and price signals. This can include payments for ecosystem services, reforming environmentally harmful subsidies or introducing tax breaks for conservation. Dedicated to uncovering the hidden costs and benefits, i.e. the negative as well as the positive externalities of agriculture and food, the beneficiaries of TEEBAgriFood are diverse, ranging from consumers to smallholder farmers. Stakeholders are policymakers, researchers, farmers, consumers, businesses, investors, the funding and donor communities. TEEBAgriFood is hosted by The Economics of the Ecosystems and Biodiversity (TEEB) Office at the United Nations Environment Programme (UN Environment). The Global Alliance for the Future of Food, the European Commission, and the Norwegian Agency for Development Cooperation support the initiative. TEEB, known for its pioneering research on the economic values of nature in 2010, brought together more than 150 experts from 33 countries to deliver a strong and urgent message to the global community on the need for a transformation of our agriculture and food systems that is sustainable, equitable, and healthy. The TEEBAgriFood initiative brings together scientists, economists, policymakers, business leaders, and farmers’ organizations to agree on how to frame, undertake and use holistic evaluations of agricultural systems, practices, products, and policy scenarios against a comprehensive range of impacts and dependencies across food value chains. TEEBAgriFood’s Evaluation Framework answers the question: What should we evaluate about food systems? And TEEBAgriFood’s methodologies answer the question: How should we do these evaluations? TEEBAgriFood illustrates five families of applications to compare: (a) different policy scenarios; (b) different farming typologies; (c) different food and beverage products; (d) different diets/ food plates; and (e) adjusted versus conventional national or sectoral accounts. TEEBAgriFood gives ten examples showing how to apply this framework and methodologies for various types of evaluations. One of them is, for example, a study in New Zealand of 15 conventional and 14 organic fields that valued 12 ecosystem services and found both crops as well as other ecosystem services to be higher in the organic fields; or another study in Thailand on pesticide subsidies found that farmer and consumer health was affected, and evaluated the impacts of a pesticide tax response combined with education about alternatives. The TEEBAgriFood evaluation framework provides a structure and an overview of what should be included in the analysis. However, methods of valuation depend on the values to be assessed, availability of data, and the purpose of the analysis. Ideally one should be able to say with some confidence what are the externalities associated with each euro or dollar spent on a given kind of food, produced, distributed and disposed of in a given way. The application of the framework requires an interdisciplinary approach, where all relevant stakeholders, including policy-makers, businesses, and citizens, understand and identify questions that are to be answered by a valuation exercise. Therefore, stakeholder engagement across sectors is critical to the effective application of TEEBAgriFood in specific contexts and policy arenas. As far as the tools are concerned a distinction is made between the valuation, in monetary terms, of impacts of the agri-food system and of policies that target that sector; and a wider evaluation of the system that takes account of other factors of importance, such as equity, human health and sustainability. The monetary valuation of impacts is organized around the idea of externalities, which are made up of impacts of the eco-agri-food system that are not accounted for in market transactions. There are several tools at our disposal for undertaking these estimations; each has its strengths and weaknesses and each is best suited to the valuation of particular externalities. The data collected from the estimation of externalities can be used to appraise a policy option in conjunction with tools such as cost benefit analysis, cost effectiveness analysis, partial equilibrium modelling and general equilibrium modelling. For the wider evaluation of the functioning of the eco-agri-food system and of different policies a number of other tools are presented. These include life cycle analysis, propensity scoring methods, value chain analysis, multi-criteria analysis, merit good assessments and system dynamics. Even though the concrete impact of TEEBAgriFood is to date limited, it is path-breaking as it is the first time that all wider benefits and costs associated with all relevant dimensions of the eco-agri-food value chain have been presented in one single report. As it is clear that only after we have recognized and demonstrated the value of what is being lost, our responses – be they policy responses, business responses, or citizens responses – will adapt, TEEBAgriFood’s influence on future research and decision-making cannot be underestimated. TEEB first achieved global recognition in 2008, when officials from 13 of the world’s largest economies (the G8+5), commissioned the first-ever global analysis of the economic benefits of biological diversity and the costs of its loss. TEEBAgriFood is one of two most ambitious applications of TEEB. The Interim Report presenting the TEEBAgriFood Evaluation Framework was launched in December 2015 at COP 21, with the Exploratory Studies released individually between autumn 2016 and spring 2017. The Global Alliance for the Future of Food, presented the underpinnings of the framework at key international events. On 4 June 2018, the Scientific and Economic Foundations Report was released, welcomed by a number of eminent people, including Achim Steiner, Pavan Sukhdev, Alexander Müller, as well as by stakeholders from international organizations, research institutes and a wide range of non-governmental organizations working for farmers rights, food systems reform, health issues, protection of the environment, as well as eradication of poverty, among them the United Nations Secretariat of the Convention on Biological Diversity, the UNCCD or CGIAR’s Research Program on Water Lands and Ecosystems. Funds have been secured to apply the TEEBAgriFood Evaluation Framework in various contexts at the country level in Brazil, China, Colombia, Ethiopia, Ghana, India, Indonesia, Kenya, Malaysia, Mexico, Senegal, Tanzania and Thailand. Across Senegal, Tanzania, Ethiopia and Ghana, the application will feature a regional narrative with national case study examples on agricultural systems, practices, products, and policy scenarios, with the overall aim of contributing to the 2030 Agenda for Sustainable Development and a wide range of SDGs. In Brazil, China, India, Indonesia, Malaysia, Mexico, and Thailand, the application of the TEEBAgriFood Initiative aims to protect biodiversity and contribute to a more sustainable agriculture and food sector with a view to moving towards a level playing field by avoiding unfair competition through low environmental standards. The foundations of the work plan will be based on an internationally agreed methodological framework, introduced in the G8+5 context by the EU, addressing the economics of ecosystems and biodiversity. It will bring together governments, business and other key stakeholders from civil society to implement activities aimed at influencing decisions and behaviours in participating countries. It will be the first time that the methodological framework developed by TEEB will be applied to an industrial sector (the agri-business sector) across the entire value chain of that sector, assessing scenarios with a view to promote change. The Economics of Ecosystems and Biodiversity (TEEB), UN Environment, Measuring what matters in agriculture and food systems: a synthesis of the results and recommendations of TEEB for Agriculture and Food’s Scientific and Economic Foundations Report, 2018 (In English– Arabic – Chinese – French – Spanish – Russian). 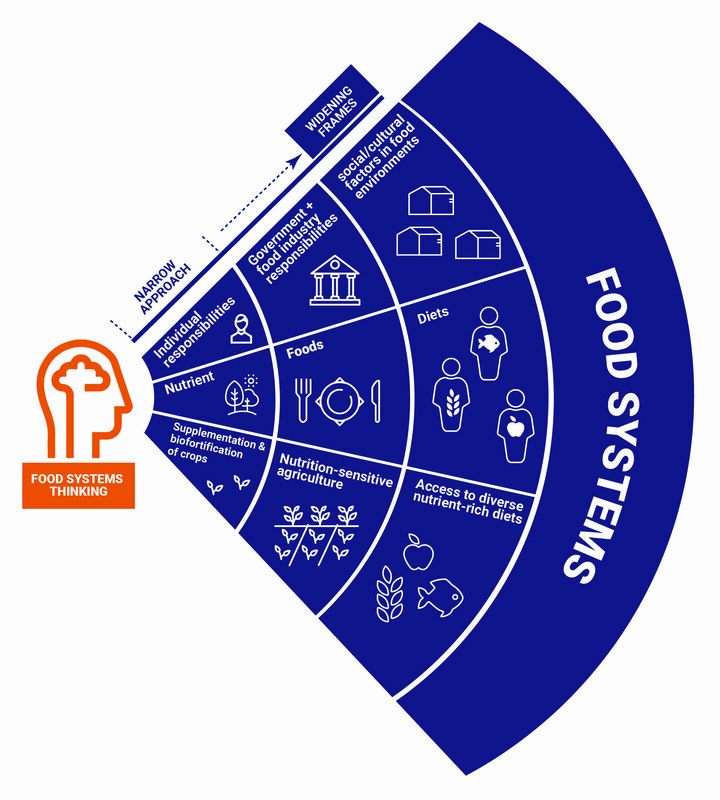 The TEEBAgriFood Initiative developed a unique comprehensive evaluation framework which allows assessing of impacts and externalities of food systems – the environmental, health, social and cultural externalities, both positive and negative, and across value chains.